When a piece of music is labeled “Symphony No. 1 in C major,” what is the first thing you expect to hear? Wouldn’t it be a C major chord? Or maybe the not C followed by some other notes in the C major chord? Well, yes. And that’s exactly what audiences were expecting to hear when a young firebrand from Bonn, Germany premiered his 1st symphony. However, the first chord, though built on C, was a C dominant 7 chord. C-E-G-B-flat. There are NO B-flats in the key of C major. How could he start a C major symphony IN. THE. WRONG. KEY?? Well, he did. He jumped around playing several 5 chord to 1 chord resolutions, until finally arriving in the right key. Hymn #79 takes the lead from Beethoven’s 1st. Though the hymn doesn’t begin with this WRONG chord, that’s exactly the tactic used to begin the 2nd half. More of that in a bit. How exciting would that be? Can you imagine being a graduate student, working to become a professional composer, and you receive a letter from the Church Music Committee Chair soliciting a hymn tune for the new hymnal? And that’s exactly what happened to Lowell Durham in 1944 while attending the University of Iowa. I’d be ecstatic, as I’m sure Durham was! What a shame that his hymn, #79, is virtually unknown. I’ve been playing this hymn over and over for the past 20 minutes and cannot figure out why this hymn hasn’t caught on. The tune is stately. The harmony is tight, enjoyable, and colors the sense of praise in this hymn with something almost regal. I can almost picture the temple musicians in David’s Jerusalem court singing this Psalm. Most Christian Churches give substantial focus to the Psalms in every Sunday service. They sing them all the time. Consequently, there are hundreds of excellent hymns of praise based on the Psalms. Many of the unknown hymns in this section of our hymnal are based on the Psalms. I wonder if our lack of focus on Psalms in Sunday services is one of the reasons we have so many great Psalm and Praise hymns in our hymnal that are unknown? Other Churches seek out tons of Psalm settings. We’re not in the habit of doing so. This brings up a question I’ve been pondering for a while. What’s the use of a new hymnal if we have no mechanism in our services to teach hymns to the members of the Church? We are encouraged to read the Scriptures in their entirety. We have Weekly classes to help us in this pursuit of learning. We give great emphasis on teaching the gospel through song in the Primary. Why does this stop when we reach teenage years and adulthood? I bet we could come up with an integrated system where music played a much larger role in our Sunday School classes. Why not continue to teach doctrine through music? Well, that kind of change would have to come from the top. Given the exciting times we live in and President Nelson’s wonderful leadership, who knows, it could happen. At the very least, I hope the new Hymnbook Committee and the presiding boards will give some serious thought to how we use the hymnal, how we can make the powerful teaching of the gospel through music a larger part of our Sunday worship. I’ll just mention 2 favorite moments in this hymn. Aspiring hymn composers, take note. There’s some excellent writing here. First, notice the full, but “closed” harmony of the first line. All four voices fit together like little puzzle pieces that cover no more than a 10th from highest soprano to lowest bass note, until the last chord of the first line. A rich and tight knit harmonic texture like this is very Bach-like. And the rising 3rds in the bass and tenor in bar 3, that’s my favorite bit. And notice how, after strong repetition in the tune (G-G-, A-A, G-G) there is a rise to the high C, a stepping down, and then one last rise to the B before settling to the cadence on G. That’s such a nice opening tune. And the accompanying secondary dominants (with the C# and the F#) lead us unequivocally to the cadence on the G chord. Then, surprise surprise, Beethoven jumps out of a cake! The second half of the hymn begins with a B-flat in the tune. Well, nowhere. Except from a good composition student’s diligent study of the standard orchestral repertoire. It’s a short reference, but it’s unmistakably a nod to the opening of Beethoven’s 1st symphony. And we’re even in the same key as Beethoven. Wonderful! More of our church music should take its lead from the great repertoire. What’s really happening here is a sequence. We go 5 chord to 1 chord in F major, “Angles shall hear the.” Then we go 5 chord to 1 chord in G major, “notes I’ll raise, Ap-.” Only then do we make our way to the “home base” 5 chord to 1 chord in C major after a slight little detour to a B-major chord which resolves tastefully, if somewhat unconventionally to the 1 chord in second inversion. This should ABSOLUTELY be in our regular rotation of praise hymns. I so declare. So let it be written… So let it be done! 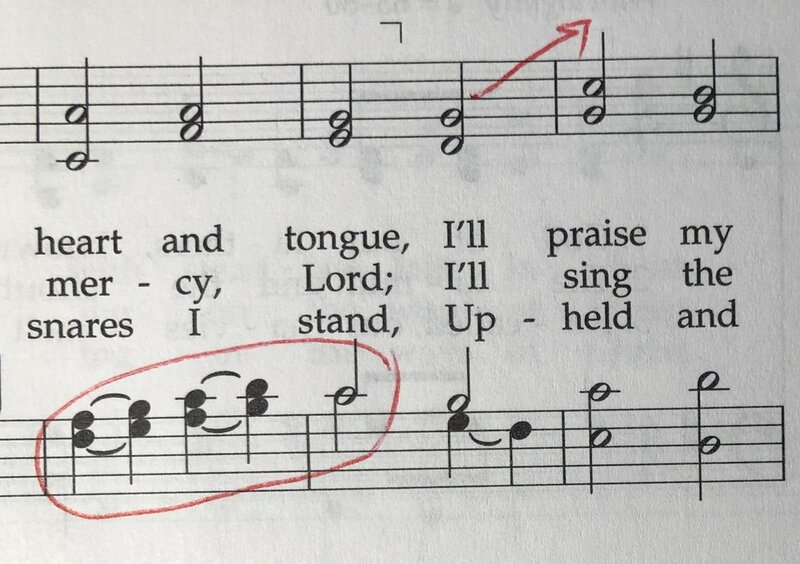 The composer of the tune, Lowell Durham, remarked that “With All the Power of Heart and Tongue [is] one of the unfamiliar hymns that the Saints avoid.” How sad that the composer of a hymn in our book recognizes the relegation of some hymns to anonymity due to not being sung in meetings. Karen Davidson hopes that “with regard to hymns that are presently unfamiliar, perhaps more worshipers will take the opportunity to learn this exciting hymn and adopt it as one of their favorites.” Hear, hear to this desire for this, and all of the great unfamiliar hymns in our book and in others! I think this is a very good hymn, and different from some of the other “praise” hymns in that it is more majestic and solemn in its praise then ebullient. I think this tune does very well to communicate the message of Isaac Watts. I think this hymn is a wonderful example of outstanding text and tune writing with a wonderful harmonization. It is most worthy of emulation. I like a tempo of around half note equal to roughly 92 beats per minute. Slow enough to maintain the majestic and stately nature of the tune, yet fast enough not to drag along. A word of caution not to let the notation in half notes slow the tune down, remembering that it is the half note, and note the quarter note that gets the pulse. I majestic registration with gravitas is called for, with principal chorus to mixture and the use of chorus reeds, adding the 16’ manual stops for the final verse.